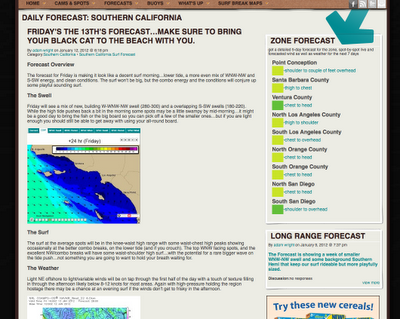 Anybody else get the Solspot So-Cal short range forecast for tomorrow (Friday, 13th)? I'm getting the feeling that it's going to be FIRING at the beach... sounds like a crossed up swell, the right tide, low wind... hmmmm.... sometimes you just get that feeling. Solspot's a great, free, surf forecast site... check it out. Problem is always the J.O.B., fortunately I live and work about four blocks from the beach so when I've got a little sneak away time I always make a run down to the beach to check it out. Yesterday, I scored four super fun, head high, beach break grinders... had to wait a bit for a corner among all the closed out walls coming through but I got those waves and that made my day a winner. I think it's going to happen tomorrow- if you've got a little window of opportunity to sneak away... do it and don't tell me how it was, I don't want to know! i hate that JOB guy!! Hey CD is going to Taiwan with Infinity soon-will send you some pics if i get any. let me know next time youre up this way-i blew off a bunch of work in December now im paying for it-only surfing weekends lately-this weekend looks crummy-next time we get some good waves and weather and you come up this way lets grab a sesh!